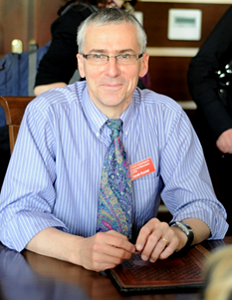 Jacek Koziel – Professor, Department of Agricultural and Biosystems Engineering, Iowa State University. Dr. Koziel achieved international and national distinction in research focused in three main areas: (1) Ambient odor and air quality measurement and mitigation focused on solving livestock odor problems and improving air quality at, and around, livestock operations. This is a critical issue in the Midwest U.S., and particularly in Iowa as a national leader in swine and egg production. Dr. Koziel has led and is currently leading several funded projects in this area. They have focused on developing and testing on lab/pilot/farm-scale odor-control technologies, as well as on providing the most comprehensive gaseous and dust emissions data from swine operations ever collected. (2) Integrated livestock housing and management systems which incorporate biosecure animal mortalities disposal. This is a critical issue for global and U.S. agriculture, and particularly food security and preparedness to manage and contain outbreaks of infectious animal diseases. Dr. Koziel has co-led projects in this area funded by Canadian and Republic of Korea governmental agencies. These projects focused on developing on-farm disposal of infectious swine and poultry carcasses. (3) Development of novel analytical methods for environmental assessment of odor, aroma, and trace organics in the context of agriculture, life sciences, and engineering. This interdisciplinary area uses highly advanced concepts and technologies from Analytical Chemistry and applies them to solving problems in Agricultural and Biosystems Engineering, Environmental Science and Engineering, Food Science, Veterinary Medicine and Animal Science. This is an important area for Ag Engineering to continuously adapt and innovate to provide food, energy, while sustainably caring for cleaner air, water and soil. Dr. Koziel’s h-index is among the highest in his department and is in the top 10% of researchers in his field (29 via Web of Science and 37 via Google Scholar). The cumulative Impact Factor of all 118 peer-reviewed publications is ~300. His work has been featured in Nature, Scientific American, National Geographic, The Economist, Smithsonian, and on the History Channel. He has received multiple international, national, and college-level awards for his scholarship. His research program is a destination for international visiting scholars. He is serving as Associate Editor for Atmosphere and Engineering and Protection of Environment. He has been serving on Ph.D. thesis committees for 7 students (as a major/co-major professor) and 26 students as a member.